Verywestham: An Ayew statistic that will surprise many Hammers fans! An Ayew statistic that will surprise many Hammers fans! Am I alone among Hammers fans in sometimes finding myself sighing when Andre Ayew enters the fray? Often the Ghana international looks to be running down blind alleyways with his low centre of gravity and head down combining to make it look like there is an imbalance between effort and guile. In reality, after his first season many fans were still undecided about the relative merits of Ayew and his £20 million transfer fee seemed to hang like a mill stone around his neck. Some fans feel that we should have held on to Sofiane Feghouli instead of Ayew. However, Ayew's high energy game is starting to pay dividends as our stunning victory over Spurs in midweek demonstrates. His MOTM award was well deserved for a brace that Chicharito would have been proud of (And needs to start delivering!). 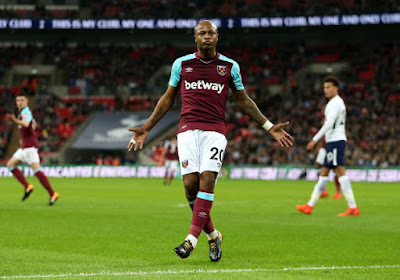 But Ayew's recent good form is perhaps more sustained than many fans appreciate as in his 15 months at the club he has been involved in more goals (10 goals and 5 assists) than any other Hammer!!! As his goal count this season mounts (currently 4), maybe he can join Michail Antonio as a double figures forward? He achieved double figures in 4 of his 5 seasons at Marseille and also with Swansea in the Premiership before joining West Ham. With Marko Arnautovic needing to prove himself and Nathan Holland waiting in the wings, the Hammers are starting to look potent out wide. Palace today should provide the ideal opportunity to build upon Wednesday night's performance for player and club. With Palace lacking firepower going forward, surely Slaven Bilic will go with an attacking formation?